Antique Pine, Clear, Dark Oak, Georgian Mahogany, Golden Pine, Maple, Medium Mahogany, Medium Oak, Neutral, Stripped Pine, Tudor Oak, Teak, Victorian Mahogany, Walnut, Yew. So now, back to the best part of this wax- you can color it yourself to create Liming Wax and Dark Wax! There's no need to buy several cans of wax with a few simple recipes. Mix a heaping tablespoon of LBBW with a cream or white chalk based paint. I use van Gogh Cashmere if I am going over darker colors. It's a softer creamier white. a teaspoon of Van Gogh Halo or Chalk for lighter colors. I use a stiff bristled brush with just a small amount of wax on the tips to apply LBBW. I use circular motions. If I am doing a chair frame I can wax the whole chair and wait a few monutes for it to harden and then buff with a papertowel- yup just a papertowel. The cheap stiff ones work best too. If you want a more shinier finish you can use 0000 steel wool. If you follow Metamorphose Studios Facebook page, I will be offering free demos on using Black Bison and creating wax recipes! Getting Our Showroom Ready to OPEN! Lots of exciting things going on at Metamorphose and we want you to come check out the new showroom opening soon! This week has been dedicated to sprucing up and getting pieces showroom ready. We have some beautiful pieces available for sale for our website and social media friends. Stop in this coming week of Sept 12-17 to have a sneak peek and take a look at our Pre-Opening Preview Sale! These can be customized with Embroidered Monograms on the Pillows! The finish trim is also available to be customized as well with nailheads or without. The cushion covers are washable with Sunbrella fabric and the body is covered with a vintage inspired velvet. Stop in to visit us while we are rearranging and moving furniture and see what were up to! We are here from 10-6pm Tuesday- Friday. The second most asked question I am faced with daily is "Where to find fabric?" Students are required to bring fabric for Chairapy, Lynne's Bench Class, the Ottoman Class, and the upcoming Upholstered Bulletin Board Class. I also allow COM (Upholstery terminology for Customers Own Material) for custom upholstered or built projects, so my clients want to know where to buy. Some have never shopped for fabric before and some are seasoned pros. You can expect to pay upwards of $20 a yard or more of a good quality upholstery fabric. Hobby Lobby and Joann Fabric have a good selection and you can use a coupon to boot! These are popular sources for students because everyone lives close to one OR they pass by one everyday. Along with bolts of fabric ready to buy, Joann's also has racks of samples you can peruse to have yardage custom ordered as well. To find your local Joann Fabric, just visit www.joann.com and click on store locator. For Hobby Lobby visit www.hobbylobby.com and click at the top on store finder. Usually you can go online and download or print a coupon. Both places will occasionally feature a 50% off coupon! How perfect is that!? There are also about a bazillion online sites to buy fabric. The only issue with ordering online is you are not sure what the actual color is going to be due to computer screen variances. If you have time- order a sample first. All you need to do is just google 'upholstery fabric' and you could surf til the cows come home! There you have it- If you can't find any fabric at any of the locations or online, then we just can't be friends! LOL! Have fun shopping my friends! The most frequently asked questions about my Chairapy Class is "What type of chair do I bring?" and "Where can I source upholstery fabric?" In this post we'll focus on chair styles to bring that are acceptable for the class. I'll also note the fabric selected for each chair. In the next blog post I'll focus on were to buy fabric. To demonstrate best, I will borrow a few images from Pinterest as well as showcase chairs from previous classes. I will also address some other frequently asked questions about the class. I want you to be prepared and get excited! Chairs with an upholstered seat and back are perfect. Chairs with arms that are completely covered with fabric inside and outside are too advanced for the class. Wing backs and club chairs are NOT allowed in class! Those type of chairs are perfect for a private class. We can discuss private classes after you have completed a Chairapy Class. Now, I know, I know- those of you who have done some upholstery insist on bringing a more advanced chair and you'll work fast and get it done in the time allotted and it's the only one you can find or it's the only one your interested in doing. What has happened in past classes where I allowed a more advanced chair is the other paying students don't receive the same attention as the advanced chair. SO, quite simply- it just can't be allowed. This is where the cliche break-up line comes into play "It's not you, it's me!" I can only work so fast with a room full of students and 4-6 chairs at one time. After each class is completed I feel like I've run a marathon! My two days off afterward is well deserved. I LOVE teaching upholstery and hope to do it for as long as my body will allow- but whew! It can take a lot outta ya! You'll find that there are many steps to complete and layers to be constructed before the final fabric is applied. I hope these pics inspire you to go find that perfect chair and fabric. GO BOLD! Occasional chairs can treated much like your soft furnishings as far as adding splashes of color to a room. The graphic blue chair above from modernhouseinsight.com is a wonderful mix of old and new. Rustic, Frenchy, and Country more your style? Take some inspiration from Miss Mustard Seed and her grain sack chairs. I adore Marion and her style! Her personality and character is expressed through her pieces and decor taste! Brooke Ulrich from allthingsthrifty.com did a fabulous job of reupholstering this found chair in a graphic print that's fun and colorful. I absolutely love the finish and fabric combo from this chair featured on Paloma81.com. A pearly cream finish paired with a cream and black striped fabric- to die for! So simple, but so elegant and fashion forward. Speaking of black and white striped fabric- how about these whimsical chairs featuring comic characters from furniture maker muebles-arevalo? I could do a set of these around my dining table. Then there's the always timeless classic look of Restoration Hardware. Worn wood finish with a linen fabric and nailheads added make for a warm rustic feel- kinda like how meat and potatoes would look if you could put it to a design style! But....if you're like me- you like meat and potatoes okay, but give me exotic, spicy, colorful food. 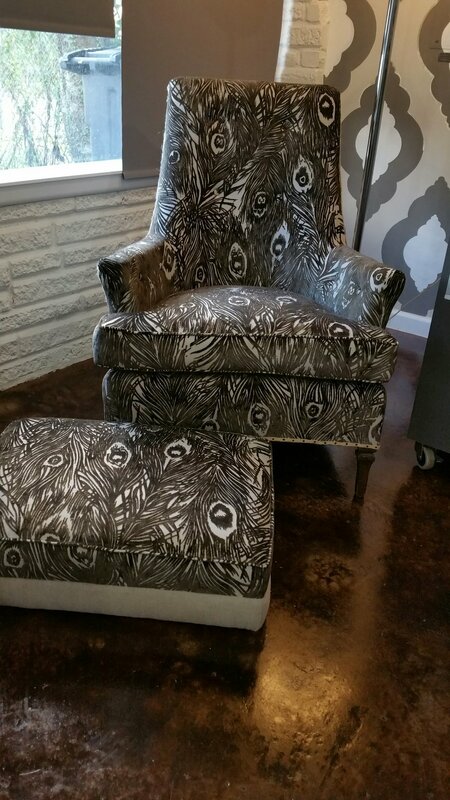 I LOVE the fabric on this chair! It's Designers Guild Amrapali in Peony. This definitely screams- "GO BOLD! Or go HOME!" Lizzy completed this chair in a previous Chairapy Class. She used my signature van Gogh Fossil Paint custom color Moth with a silver pearl glaze on the frame and paired it with a nice chenille warm gold and grey toned modern graphic print. The buttons were added to accentuate the fabric pattern and added a small touch but it makes a hug impact. Another perfect combo of old meets new! Elaine completed this chair in another previous Chairapy Class. She chose a gorgeous French script linen fabric and burlap braided trim to update her chair. Her frame was painted in MOTH (It's a popular color- you'll see!) If you want to add nailheads to your chair I will go over a few techniques and tips I've learned to help you keep the heads straight and achieve a professional look. I hope this article helped with your chair selection. As you can see some have the small amount of padding on the arms- that is perfectly okay to bring to class. It's fully upholstered arms that are a little more advanced. My goal is to teach you the main techniques and skills used for most upholstery and start with basic chairs. Dedication and practicing the basics will get you well on your way to becoming a great upholsterer in no time! I certainly don't you to be overwhelmed and become discouraged.